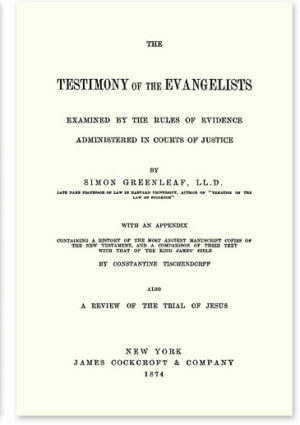 In 1846, Simon Greenleaf published The Testimony of the Evangelists. Based on this slim volume, apologist Philip Johnson claims that Professor Greenleaf “must be regarded as the pivotal figure in juridical apologetics.” I’m not so certain about that. 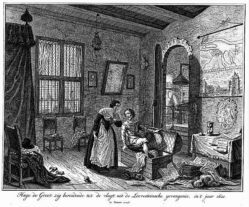 Seems to me that Greenleaf built on the ideas of Hugo Grotius, but did not give him credit. Greenleaf was an eminent law professor and one of the founders of Harvard Law School. In 1842, he published A Treatise on the Law of Evidence, the first major American evidence treatise that was not based on an English treatise. As if these real achievements were not impressive enough, apologists gild the lily by exaggerating his accomplishments. For example, apologist Lee Strobel claims Greenleaf’s treatise is still considered “the greatest single authority on evidence in the entire literature of legal procedure.” The truth is that few living lawyers have heard of Greenleaf. Although present-day courts occasionally cite Greenleaf, Prof. Wigmore is more authoritative today. I see three main points in Greenleaf’s apologetic argument, and Grotius led the way on all three. First, Greenleaf began his book with an introduction “To the Members of the Legal Profession” in which he explained why lawyers might have something to say about Christianity. If a close examination of the evidences of Christianity may be expected of one class of men more than another, it would seem incumbent on us, who make the law of evidence one of our peculiar studies. Our profession leads us to explore the mazes of falsehood, to detect its artifices, to pierce its thickest veils, to follow and expose its sophistries, to compare the statements of different witnesses with severity, to discover truth and separate it from error. Grotius never made such an explicit statement that lawyers are the best people to separate truth from fiction. Nonetheless, Greenleaf followed in the footsteps of Grotius, the first lawyer to systematically analyze the evidence for Jesus’ resurrection. Greenleaf treated the Gospels like documents to be introduced into evidence and made a two-prong argument regarding their probative value: (1) authenticity and (2) credibility. Greatly oversimplified, authenticity means that a document is genuine (not fake), and credibility means you can believe the document tells the truth. The linchpin of Greenleaf’s authenticity argument is the ancient document rule. For a more detailed discussion of the rule, read this interesting article about why the federal judiciary has considered scrapping the rule. He who would disprove any Writing which has been received for many Ages, is obliged to bring Arguments that may diminish the Credibility of such a Writing; if he cannot, the Book is to be defended, as in possession of its own Authority. 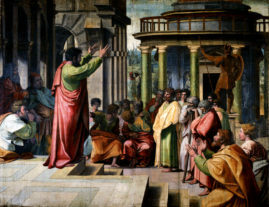 The credit due to the testimony of witnesses depends upon, firstly, their honesty; secondly, their ability; thirdly, their number and the consistency of their testimony; fourthly, the conformity of their testimony with experience; and fifthly, the coincidence of their testimony with collateral circumstances. Greenleaf applied these standards to the four Gospels and determined that they are credible. However, Greenleaf repeated many of Grotius’ questionable arguments. For example, Grotius and Greenleaf both claimed that contradictions between the Gospels actually enhance their credibility. Grotius argued that differences between the Gospels “ought to acquit these Writers of all Suspicion of Deceit” because witnesses who bear false testimony “relate all Things so by Agreement, that there should not be any Appearance of Difference.” In other words, contradictions between the Gospels prove that the Gospel authors did not conspire together to tell the same story. Likewise, Greenleaf claimed, “There is enough of discrepancy to show that there could have been no previous concert among” the Gospels. Although I doubt that Greenleaf was “the pivotal figure” in legal apologetics, he was certainly influential. Modern legal apologists often cite Greenleaf as their inspiration. For example, Pamela Binnings Ewen candidly acknowledged that her book, Faith on Trial, merely updated and expanded Greenleaf’s original analysis. Ewen and other legal apologists – quite rightly – are not embarrassed about copying Greenleaf. In court, lawyers avoid making “novel” arguments and instead try to cite prior authorities to support their client’s case. I am therefore puzzled that Greenleaf never so much as mentioned the name of Hugo Grotius. New Wigmore: A Treatise on Evidence: Evidence of Other Misconduct & Similar Events § 3.2.4 Greenleaf; the Emergence of Wigmore. Simon Greenleaf, The Testimony of the Evangelists §8 (1846). Hugo Grotius, On The Truth of the Christian Religion Book III, Section XIII. Charles Templeton, Farewell to God 100 (McClelland & Stewart 1996). “In our search for truth and error, we will use the format of the original Greenleaf treatise as a basis for our analysis, but we will apply the Federal Rules of Evidence and common-law principles to the most recent facts and information available to us in the last decade of the twentieth century.” Pamela Binnings Ewen, Faith on Trial: Analyze the Evidence for the Death and Resurrection of Jesus (pp. 8-9). B&H Publishing Group. Kindle Edition. 2016 – Henry Hock Guan Teh, Principles of the Law of Evidence and Rationality Applied in the Johannine Christology (Wipf & Stock 2016). Copyright by © 2018 by robertgeorgemiller.com. All rights reserved.